This week’s automotive anxiety is rooted in maintenance payments, mega-mileages, guaranteed results, unexplained accidents, habitual offenders and a veritable cornucopia of cartastrophes. My 2012 SEAT Leon 1.6 diesel automatic has done 43,000 miles in 5 years. During that time the gearbox has operated faultlessly. Does it now require servicing in terms of lubricant/hydraulic fluid change or should it be left alone? Habitually, it is driven gently in busy traffic. More information recently came to light about this. VAG designed the low torque 7-speed twin-dry-clutch DSG to be maintenance-free, ‘sealed for life’ and filled with synthetic oil. Unfortunately, at high temperatures, this oil can become conductive, causing the Mechatronics to lose drive, so the transmissions were recalled to be filled with mineral oil instead. (Yours was probably built after the recall and was always filled with mineral oil.) Now it seems that, with mineral oil inside them, the transmissions are no longer maintenance-free and require a change of oil every 40,000 miles. My left-hand drive 10-year-old diesel Skoda Octavia estate has done 311,000kms. It has been regularly serviced and had all the upgrades advised by the garage. I have had hardly any problems with it; most recently the battery was replaced for the first time. What should I be worried about? I guess this is a 1.9TDI that was a more reliable engine than the 2.0TDI or the later 1.6TDI. Your 194,375 miles is a typical taxi mileage. If the timing belt, tensioner, waterpump and the aux belt have not been replaced in the last 100,000kms, then they need to be. I am thinking of buying a 2011 BMW 320 convertible from a small trader for £10,000. He is offering is a Platinum warranty from WarrantyWise for 6 months. The warranty contains limits (eg £50 per hour on labour). He tells me I can increase the cover with WarrantyWise at my own cost. Does a restricted warranty such as this meet his legal obligations as a ‘trader’? As a trader, he is liable for any significant fault that could have been present or developing with the car on date of sale for 6 months from the date of sale. And it's either/or. The warranty cannot cover any fault that could have been present on date of sale, because that would be insurance fraud. On 30 November 2016 I had a bad accident in a Toyota Yaris. The car was a complete write off. It all happened quickly, but I seemed to have hit something in the carriageway or there was some malfunction in the car that caused me to lose complete control and drift into the adjoining lane where I was hit by a bus. The Insurers have treated it as a fault accident. I have now received a letter from DVSA and Toyota notifying a problem with the Front Driver Airbag Inflator (Campaign BGG22), which will involve a recall to replace the airbag inflator. Is this just a coincidence, or should it put me on enquiry? I’m hoping you change someone's driving habits. My father has just bought a new, powerful saloon car. I was hoping the salesman, during the test drive, might have queried why he was pumping the brakes. Sadly, that didn't happen. It makes for an uncomfortable experience for any passenger lurching forwards and backwards whenever the car needs to slow. Perhaps you can explain why this might still need to be done on today's cars because I can see no reason? In a heavy stop, for example on a motorway when the traffic half a mile ahead has come to a standstill, releasing then re-braking cools the brakes. But there is no need to do it in everyday driving. It could be that your dad remembers the days when hygroscopic brake fluid used to boil, so the brakes had to be pumped to stop the car. Do you have any guidance on the Subaru Diesel crankshaft question? There appear to have been numerous reports of failure between 80,000 and 110,000 miles and the web pages in eBay are full of cars advertised as “spares or repairs” due to seized engines. At the moment I am running a petrol Subaru Legacy that needs replacing after 14 years. I’ve spent quite a lot on it (£100s rather than £1,000s) over the last year and it’s running fine just now. We have another ‘classic’ Legacy that is 18 years old that my wife uses to tow her horsebox, but it really can’t go on forever. I need to know whether the Subaru diesel is a disaster waiting to happen and whether the saving in fuel costs is unrealistic against the cost of a replacement engines quoted between £6,000 and £9,000 by different sources. Should I look elsewhere, such as KIA? My daughter is contemplating buying a 2006 Chrysler Galaxea with 105,000 kilometres and automatic. She lives in Spain and wants to exchange it for her KIA, which is now very old (though functioned very well). She would want to tow a caravan occasionally but her main use is everyday local running around and the occasional longish trip. A car of that type is essential because her daughter is wheelchair bound. I am rather worried because I do not know the car and have read some worrying write-ups. Your comments would be much appreciated. There is no such thing as a Chrysler Galaxea. There is a Chrysler Grand Voyager that is a big American MPV assembled in Graz, Austria with an Italian VM 4-cylinder diesel engine and usually an automatic transmission. Can be troublesome. Or there is a Ford Galaxy that is a much nicer, slightly smaller 7-seater very pleasant to travel in and far better to drive than what I guess to be the KIA Sedona that your daughter is abandoning. New research has found that one in four Brits spend a month a year commuting using an average of three modes of transport a day. The research, which was commissioned by 3-in-1 transportation app Ubeeqo, also found that: One in four people use the car, take the train and walk to work daily. Train users endure the longest commute. Car is preferred mode of transport. A quarter of commuters spend up to 712 hours a year travelling to work. More at www.ubeeqo.co.uk. Your item titled 'Inflated Opinion' has me worried. I have a Golf SV and the recommended pressures for normal loads is given as 41PSI Surely the 31PSI that you recommend is rather low, or do I have duff information? Which size wheels and tyres? If they are 55 profile, then 31 PSI cold all round will be fine. As soon as you've done a few miles the heat that puts in the tyres raises the pressures to around 34-35 PSI. At 41 PSI cold / 45 PSI hot the car will suffer severe road roar, lack of steering feel and the ride quality will be terrible. I have just bought a new Toyota GT86 from Toyota Worcester Motorline, but, although the car was in stock and I ordered it on 30th December 2016 with promised delivery on 6th January 2017, the car was not ready until 16th January because the gearbox linkage was locking up and the battery was wrongly connected, blowing fuses, etc. I now feel this car should be replaced or a refund of money paid. They have refused my offer to exchange cars. Can I ask for anything? You could attempt to invoke the Consumer Rights Act that came into effect in November 2015 but has not yet been properly tested through the courts. But, since the car is now fixed and was fixed fairly promptly, I don't think you have a strong case against the dealer. See: /faq/consumer-rights/ Fighting your case could also leave you without a car for months. In your carbycar section, where faults on a car are listed, will these be faults you've had just one report of, or multiple reports of? Where you think there's a general fault developing on cars, rather than just one car? So, for example, in the Lexus IS 2005, there's a report of failed front pipes and failed satnav. Would these be one-off faults, or issues you'd think likely to occur on any older IS, suggesting some sort of design fault or weakness with those items? Each is a single, dated, report, basically so we have a handle on it in case the manufacturer starts getting shirty. It's an accumulation of repeated reports of the same fault that sets the worries in motion. I'm considering changing cars and wonder if you could offer advice about which should be on my shortlist. I am not a person that worries about what badge a car has and currently drive a KIA cee’d SW 1.6 CRDI, which has been outstanding but, as it's eight years old, I need to consider what to replace it with. As we are getting older, we would like something a little higher, and as we occasionally have to carry a large load, it has to be a car with a decent capacity. I've become used to the power and torque of a turbodiesel and the decent mpg, but am loathe to buy another diesel for all the reasons you've mentioned in your column over the last few months, however, I would still like to buy something with decent performance and reasonable mpg. I've thought about the Mazda CX-5, Honda CRV, Citroen C4 Grand Picasso and KIA Sportage and Carens (but this doesn't have a spare wheel, so I'm not keen) and was particularly interested to read about the Citroen with the 1.2 turbo engine, but do these smaller turbo engines deliver power across the whole range? Alternatively, are there any estate cars with a raised sitting position, so we don't have to stoop to get into the car? 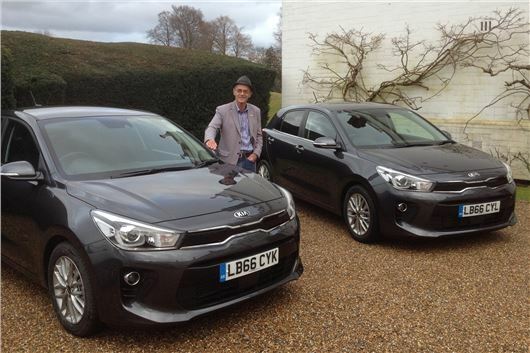 KIA itself has a couple of answers in the forms of the KIA Niro hybrid: /road-tests/kia/kia-niro-2016-road-test/ And the KIA Sportage 1.6T GDI GT: /road-tests/kia/kia-sportage-2016-range-road-test/ A further alternative is the capacious Citroen C4 Picasso 1.2 Puretech 130. I had no idea that there were any parking restrictions at McDonalds but apparently so. My brother in law has just received a notice to say that his car overstayed in their car park in Arnold, Nottingham. He's actually just given the car to me and I was driving on the date in question (16/01/17), but I was eating in there at the time. I've been signed off work for various mental health issues and sometimes I just find it helpful to sit where there are people and work on my laptop rather than sit at home alone. I did though, on that date, eat and drink and have payments on my bank statement as proof. Can I appeal the fine? I have a 2001 Renault Megane 1.6 Hatchback. Over the past year it has started to exhibit a strange trait. On long right-hand curves, if I increase power to the front wheels it tightens the turn and I have to slacken the steering wheel to compensate. If I decrease the power it widens the turn and I have to turn the steering wheel more to compensate. This is opposite to what a front wheel drive car should do. On long left hand curves the car drives completely normally. I also have a same age Megane Cabriolet with the same running gear and this drives completely normally. I have tried moving the car under power backwards and forwards with the hand brake on to see if the engine moves, and it doesn't. The tyre pressures are correct all round and all wheel nuts are tight. Over the past year I have put the car into garages for: 4 x new tyres; replacement engine stabiliser; 2 x front strut top bearings; 1 x front inner rack end; 1 x front offside ball joint; had steering alignment checked; 2 x new rear shock absorbers; had rear suspension torsion bars checked; had the suspension checked for tightness all round. All to no avail. Any advice please? This reads as if there is movement in the rear suspension or something bent that amounts to a bit of rear steer. This is despite everything you have done to eliminate the possibility. You don't mention a rear suspension alignment check. I would like to query your comments about diesel engines in the 14 January 2017 edition. I have a 2006 Mk3 Ford Mondeo TDCI, bought new, which has now covered over 150,000 miles and am looking to replace it. However, in your answer you say that diesels potentially need a new timing belt with tensioner, water pump and auxiliary belt every four years and an exhaust gas recirculation valve. However, wouldn't a petrol model also require these items? With the timing belt it would surely only require changing if it wasn't a 'chain cam' and with the latter my Haynes Manual states that the petrol version of the Mondeo has an exhaust gas recirculation valve, which would also presumably need changing. I am aware of the possible problems with diesel particulate filters and will factor this information into my decision about which car to buy. My Mondeo is too old to have a diesel particulate filter but the chain cam has never been changed nor have I ever had problems with the exhaust gas recirculation valve. Incidentally it still has the original clutch, despite my towing a caravan with it, and it regularly exceeds 60 mpg, solo on a run, according to the dashboard computer. A 2006 Mondeo had a famously tough duplex chain Duratorq diesel engine that was also notoriously dirty, which was why it was dropped. No DPF to worry about. But lots of harmful emissions. You didn't, but others have needed a new EGR cooler at some time. Since January 2011 every new diesel in Europe has had to have a DPF to meet EU5 and now to meet EU6 most of them have SCR systems requiring the addition of AdBlue at £16 for 10 litres. Consequently the EGR has to work a lot harder and frequently need replacing at anything from 40k miles; DPFs clog with soot if used for short distances and generally fill up with ash from around 80,000 miles at which point they can sometimes be cleaned for £350 or can need replacing at anything up to £2,000 for a pair. Petrol engines also have EGRs, but the only cars I have seen them as a problem in have been VWs. Yes, belt cam petrol engines need timing belts replacing too, but the mention of chain cams was edited out by the subs. I bought an approved used Polo 1.2TSi from a VW dealer in August 2013. It was first registered in June 2010 and had about 17,500 miles on the clock. It has now covered about 45,000 miles and has been regularly serviced by another VW dealer. I took it in 3 weeks ago with a misfire and several warning (yellow, not red) lights on the dash. They have diagnosed that the timing chain has stretched and caused burn damage to the valves and seats. I have a comprehensive warranty with Allianz (purchased through VW) and they are saying it isn’t covered because the problem is down to wear and tear and not a mechanical failure. I have raised a case with VW customer service and the best offer of help I have had is £1,000 discount on a new engine, which would still leave me with a bill of over £3,700. I have searched around and found VW Technical Product Information bulletin 2026513/5 dated 01 Oct 2012 that appears to cover exactly this issue and all further damage caused. This cuts no ice with the dealer and customer service. Do you think I have a case to take to the relevant ombudsman / local Trading Standards Office or could you advise a better route? I can’t believe it is considered acceptable for an engine to fail at such a low mileage when the vehicle has been serviced regularly by a VW dealer, the cause of the problem is covered in a VW TPI and a warranty has been in place for the whole time I have owned it. Your help would be much appreciated. You were sold a rubbish warranty because this is an intrinsic part of the engine that should last the life of the engine and has mechanically failed. It is only a 'wearing part' because VW cut costs and extended the lives of the stamping tools that stamp out the chain links so it became a lottery if you got a good chain or a bad chain. So, though you bought the car a long time ago, you bought an ineffective warranty from the same dealer who sold you the car. You could take your case to the Motor Ombudsman. Instead I'd threaten to sue the dealer on the grounds that for the chain to have failed it must have been of “unsatisfactory quality” in the first place and for it not to have been covered by the warranty you were sold, that warranty must have been of “unsatisfactory quality.” Take your case to Small Claims in The County Court. Law here: /faq/consumer-rights/ I can't guarantee you will win, but the threat of this action might secure better treatment from the dealer and from VW. My VW dealer uses Mobil 1 oil as standard. VW UK however, seems to suggest that they use Castrol as standard. Which do you recommend for a VW Golf 2.0 GT TDI BMT, or is there nothing in it? I have 10k maximum service regimes and do not want longlife oil/ extended regimes. In addition, when do you recommend a fuel filter change? The dealer reckons 60k? I used to have mine changed every 10k on my Skoda VRS TDI and it ran like a Swiss watch for over a decade. The dealer wants £55 to change the fuel filter. The Golf is still under warranty until Nov 2017. I don't want to skimp and store up potential problems. I do 300 miles a week, 200 at motorway speeds, so the car gets a good workout at optimum temperature. My understanding is that Mobil 1 is the finest oil in the World and is the only fully synthetic 'fully synthetic' oil. Other ‘fully synthetics’ are high concentration semi-synthetics. But VAG might claim that the particular Castrol it prescribes has special additives. It's more likely that there is a deal between VAG to get bulk Castrol at a special price. Good idea to get the fuel filter changed at least every 20k miles or when it appears to be getting partially blocked. We have owned a Honda Jazz Hybrid for the last 5 years with no problems whatever. What would happen if the electric motor failed for whatever reason? Would the car still be driveable using the petrol engine only, or would it have to be recovered? I’ve asked Honda and been advised to ask our Honda garage who have advised us to ask Honda. Can you help please? I bought a 2012 Skoda Octavia 1.6TDI DSG estate in 2013 from an approved Skoda dealer on 3 years hire purchase. It was a manufacturer approved used car with 12,000 miles. By July 2014, the gearbox failed with gear indicators on the dashboard flashing simultaneously with a spanner sign. The Skoda dealer in Croydon took the car in and said repaired it under warranty. I then moved to Kettering. In November 2016, the same thing started again at the gearbox, even losing drive sometimes. I contacted Skoda in Croydon. They wanted me to bring the car back for a check but it is too far. I am wondering what I should do, as I believe the car is not safe for me to drive to Croydon in case the gearbox fails while a HGV is behind me on the motorway. Then I contacted Skoda UK trying to explain. They asked me to take it in to a Skoda garage in Kettering, which I did. Knowing that the 7-speed Auto DSG gearbox Mechatronics has failed again, they are asking me to provide evidence of gearbox service and so on, which I really do not keep. I think they are just looking for a reason not to repair my car as it is out of warranty and I have made all the payments on the car. I tried to explain to them that this 7-speed Auto DSG gearbox they fitted in Skoda cars is not fit for purpose as failing is a frequent occurrence. I have seen from my Internet search that there has been a re-call on those models with 7 Speed Auto DSG gearbox in other countries like New Zealand. I am now in the verge of losing my car as there is no way in the world I can afford to fix it. What shall I do? The 7-speed dry clutch DSG was designed as a non-maintenance ‘sealed for life’ transmission with dry clutches rather than oil clutches and transmission fluid not shared by clutch and transmission. That's why they were filled with synthetic fluid, but this later proved to be conductive at high temperatures, which is why the transmissions were recalled to be filled with mineral oil instead. I’d wondered how long this mineral oil would last and it now turns out that the twin dry clutch 7-speed DSG is scheduled for a transmission oil change every 40,000 miles. Not only had this not been carried out, but SO’s Leon had done 117,000 miles, so unfortunately he had no basis for a claim. We are looking toward exchanging our 2010 Fiesta 1.6TDCi Titanium 5-door (presently 61,000 miles) for a similar sized nearly new or possibly new car. Now we are only travelling around 4,000 mile a year, so the replacement needs to be petrol driven, with a similar spec, but comfort is a priority as we are both in our early 70s. An automatic is a possibility but it needs to have similar power to the Fiesta to cope with good overtaking and the hills that we have around here. It also needs to be reliable, similar to that experienced with our Fiesta, which has needed very little by way of repairs over the last 6 years. We have approx. £9,000 plus our Fiesta toward a replacement. What can you recommend? Suzuki Baleno 1.0 BoosterJet 6-speed auto. Or, for a 7-year warranty, the new model KIA Rio. On Radio 4 news on Saturday this morning a report called for all HGV drivers to have truck satnavs installed rather than rely on standard car satnavs in order to avoid low bridges and weight restricted roads. My DAF LF truck has one built in, and I also have a separate TomTom truck satnav (both are less than a year old). Neither has a much of a clue about weight-restricted roads and routinely directs me to use them. For this requirement to be worth anything, the makers of the satnavs need to up their game considerably. That's interesting. The rest of us wouldn't know and would think this report was a good thing. Don't these report writers ever research anything? I hope you can help me. I need to change my much-loved 2003 Nissan Micra SE by July 1st. Mine has 160,000 miles on the clock and while I am a 70 year old, I am young for my age and a busy woman. It has not been without its problems and I have spent a lot of money on it and sadly it really has to go before there is another big bill and it is time to re-tax and insure. I have been looking for a replacement and naturally looked to a new Micra but the reports I have read are not that great and I am looking to replacing with as near as possible like for like. The car must be red (not the new Micra red), have 5 doors, sit reasonably high, be nippy as I regularly do long distances and have the equivalent amount of boot space that my existing car has. Preferably petrol. Is there such a thing? It must have a good turning circle and excellent window visibility. I do not want a larger car as parking spaces are getting smaller and ideally I want value and reliability for my money. My present car has a hidden storage and I love that, but it is not life and death. If such a car exists, and I can buy outright, I then think about leasing? Is there a car out there for me?